Felines are a common and popular choice for an animal companion, and can be found in many households across America. 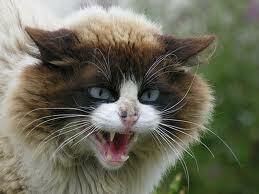 However, cat owners should be aware of the potential risks associated with having one in your home. One risk is that cats can transmit cat-scratch disease, also known as cat-scratch fever. Yes, this is a real disease, and not just a Ted Nugent song from the 70’s. This infection is caused by Bartonella henselae, a bacteria found on cats, especially kittens, which are oftentimes infested with fleas. The bacteria is typically transmitted through a bite or scratch, but also can be passed by simply petting a cat and then rubbing one’s eyes or touching one’s nose. A sore or blister develops a few days after inoculation and is very slow in healing, and typically the patient develops a large, swollen lymph node closest to the site of bacterial entry. Occasionally fever, joint pain, fatigue and/or other symptoms occur. Usually the infection resolves on its own, but sometimes antibiotics such as Zithromax are used for more severe or prolonged cases. For those who must have a cat, try to avoid getting bit or scratched, and make sure your pet is adequately treated for fleas. Finally, always wash your hands immediately after petting.